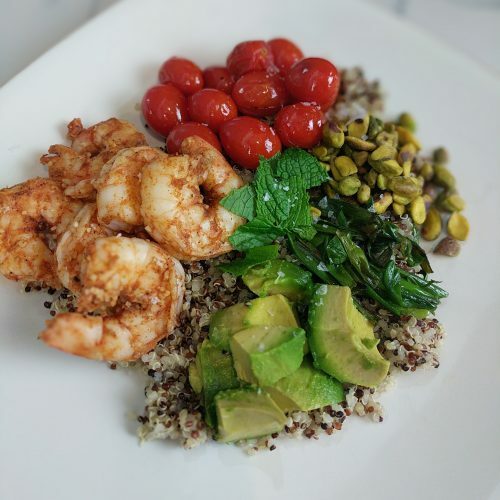 This shrimp and quinoa cobb salad is sure to delight! This salad is perfect for those hot summer days! It is light and jam packed with protein! Who doesn’t love a good cobb salad? As I get older (and wiser) I love a meal with options and different flavor profiles. 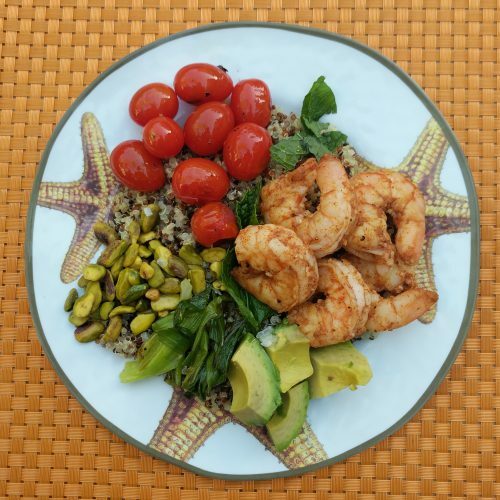 This shrimp and quinoa cobb salad has 432 calories, 22g fat, 30g carbs and 26g protein. 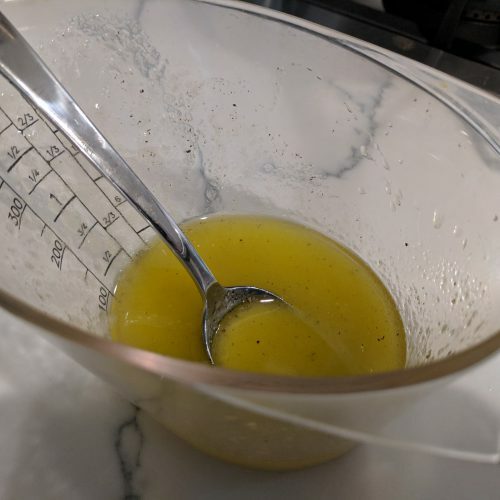 If you want to reduce the fat content you can use a low fat dressing instead of my homemade lemon vinaigrette and/or substitute the avocado for another veggie of your choice. Just please note that both the olive oil and avocado give you a nice dose of healthy fats! If you want to reduce the carb content just use half the quinoa (I used about a half cup cooked per serving). 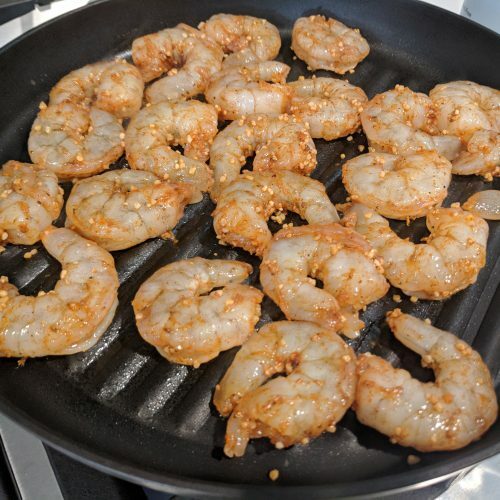 If you want more protein without all the carbs, just load up on the shrimp! 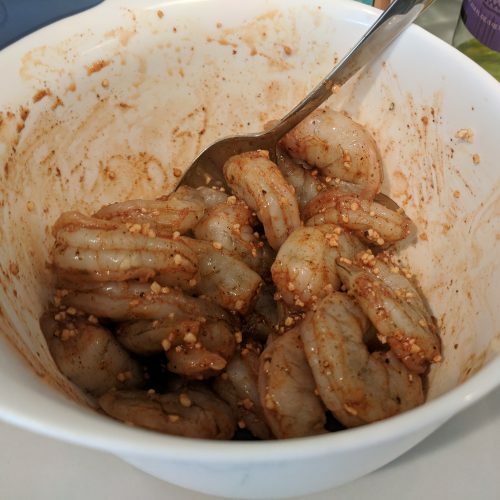 This recipe is gluten-free and if you are vegetarian simply remove the shrimp! 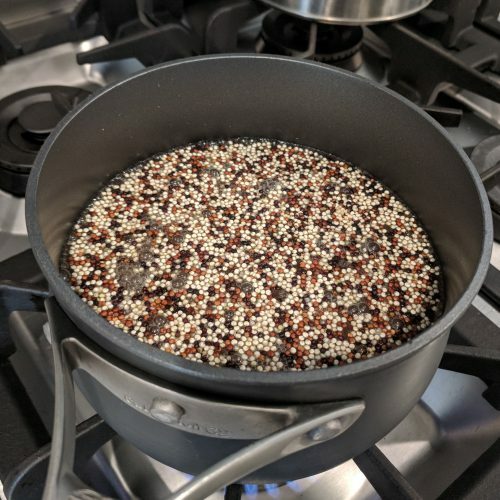 Quinoa is another source of protein in this dish, so I would just add another veggie (like sauteed spinach or zucchini/squash for the grill pan) to fill out the dish and call it a day! 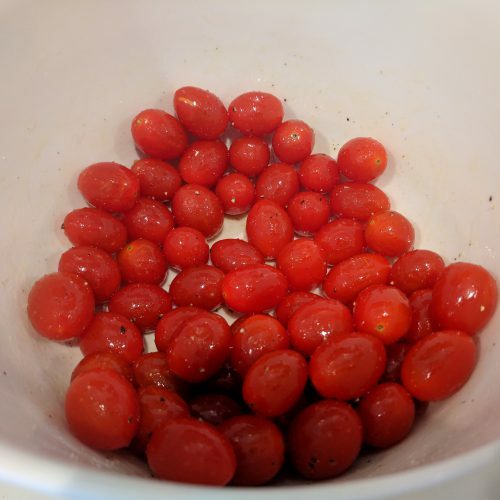 The grilled tomatoes in this dish are my favorite! I love a good hot tomato that is a burst of flavor in my mouth. However, I could do without the mint in this dish. My husband is a lover of all things mint, so I added the mint to his dish but left it off of mine. As always this dish is completely customizable and you can mix and match veggies/protein as you see fit! 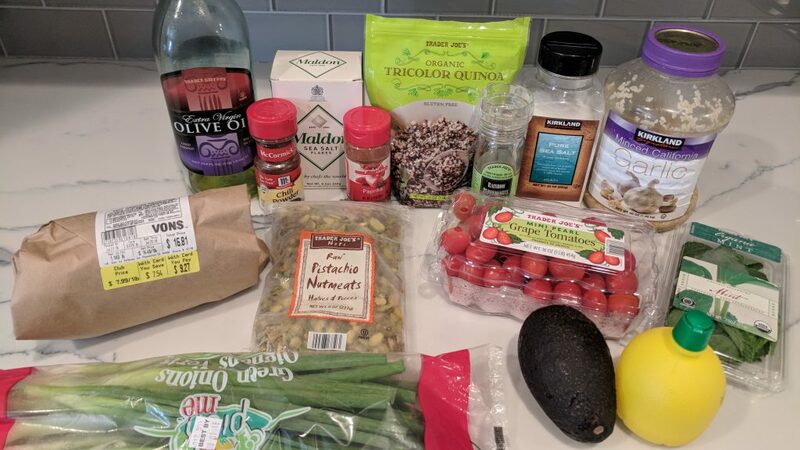 I buy my nuts at Trader Joe’s (photo below)! They have the best selection for the best price. Me and my dad would bond over pistachios as a kid so these nuts hold a special place in my heart! Flaky sea salt is a nice addition to this dish. I bought it at Target however you can probably find it at your local supermarket as well. 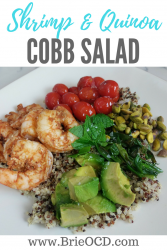 Hope you enjoy this different take on your traditional cobb salad! toss shrimp with paprika, chili powder, lemon, garlic, salt and pepper. set aside. 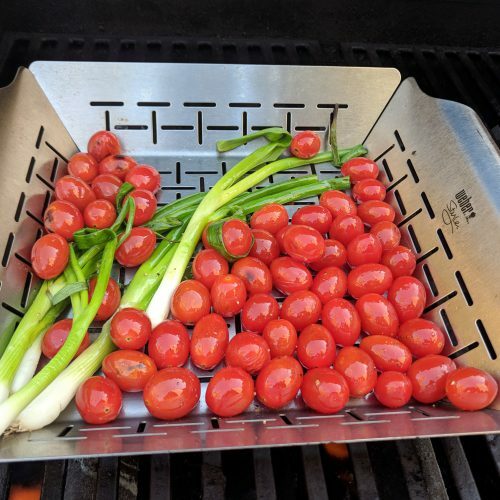 place tomatoes/scallions on grill for 6 minutes or until tomatoes start to split. slice scallions into approx 1" pieces. in a small mixing bowl, make the dressing by mixing the lemon juice, evoo and salt, pepper. make the bowl by placing quinoa at the bottom.Top with scallions, tomatoes, shrimp, pistachios, avocado, mint, flaky sea salt and dressing. Enjoy!